As parts of [How to Read Power Supply IC Datasheets], thus far we have discussed [Datasheet Cover Page], [Block Diagram], [Absolute Maximum Ratings and Recommended Operating Conditions], [Key to Electric Characteristics], and [How to Interpret Property Graphs and Waveforms]. 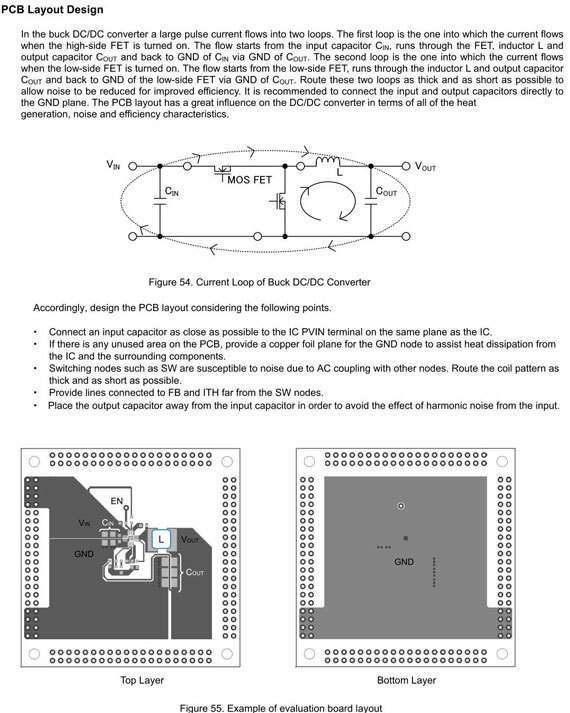 In this section, we explain [Application Circuit Examples] that are provided in the datasheets. Power supply IC datasheets, beyond covering power supply ICs, often provide examples of application circuits for an IC. If such examples are not provided, data that complement application circuit examples should be included separately under topic names such as Application Notes. By providing typical circuit examples using the IC, the purpose is to invite engineers to utilize the IC as a starting point for a design project. Although descriptions of the pins and functions that are incorporated are provided in text format, explanations without any circuit diagrams may be difficult to follow, and conversely, it may be difficult to explain without using any examples. Although each circuit example must be checked with the manufacturer of the circuit to ascertain whether the example is a real-life circuit, most application circuit examples are taken from the circuits that are actually configured and that have been verified to work in actual applications. Also, in many cases, an evaluation board for the circuit may be available. Fortunately, circuit configurations using switching regulator ICs include template circuits that are modeled on the IC; using the template, it is possible to meet required specifications by simply modifying the constants for the external parts. To meet special conditions and requirements, obviously further adjustments and modifications may be needed; however, the required amounts of design and evaluation time can be reduced by using application circuit examples and evaluation boards, and by making modifications to suit your own design needs – an approach which we would recommend highly. The circuit diagram shown below is taken from the datasheet for the BD9A300MUV switching regulator IC used in an example. The IC requires several capacitors, resistors, and one inductor, and parts values are set to match the output voltage. Also, some datasheets provide values and part numbers for external parts, based upon typical output voltages. Such information is also provided in the datasheet for this IC. Excerpts from the information are shown here as an example. In the example of this IC, basically you can precede with the design task by selecting, from the table, the components corresponding to set voltages in reference to the application circuit example. Since this is a simple-to-design power supply IC containing a relatively small number of components, the provision of such information can be a significant aid in speeding up the execution of the design task. With regard to the application circuit example, we show an example of problem that arises in some cases, such as “I put together a circuit based on the circuit diagram and parts provided in a datasheet, but it does not work.” Assuming that there are no trivial wire connection mistakes, in most cases the cause of these problems can be traced to the board layout. Now that switching power supplies have been designed on an almost routine basis, there is an increased awareness of the importance of board layout in the design of a switching power supply. Nevertheless, there have been cases where attempts are made to evaluate a universal board, or occasionally a board assembled in terms of undesirable aerial wiring. Or in less severe cases, wires were routed and parts were laid out improperly, creating significant spikes, and in some cases resulting in damaged ICs. To prevent such problems, datasheets and application notes provide example board layouts. Because many design efforts involve the use of double-sided boards, in some cases electronic files (Gerber files) that can be used directly in the design of a board and providing two-side layouts are supplied. As mentioned above, an appropriate board layout is needed in order for the switching power supply to achieve the expected performance and characteristics. Because an application circuit and a board layout are two sides of a coin, we strongly recommend that you reference such information for both purposes. Provided below for your reference are information on board layout extracted from a datasheet, and an example layout page. In connection with the discussion on evaluation boards provided above, we might mention that datasheets contain part numbers for evaluation boards and reference URL information. More recently, manufacturers’ webpages offer links to pages containing product information. As an example,click here to open the top page on BD9A300MUV and click a [Eval Board Data Download] button to view it. Evaluation board manuals provide board specifications, modification methods, and board layout. In addition, Gerber files for board layout may also be available. ・As a typical circuit example, an application circuit example represents a starting point for the selection of parts (including part numbers and parts values) and for the design process. ・The operation of the application circuit described in the datasheet has been basically verified by the manufacturer, and in some cases evaluation boards are also available for users’ convenience. ・To be on the safe side, ascertain with the manufacturer whether the circuit provided is the one for which the operation has been checked out. ・Because board design is also important for achieving the expected performance and properties, it should be used along with circuit examples.